Remember this save? Forget Gordon Banks' diving save from Pele in Brazil '70. To me, THIS was the best save by any 'keeper in the world. Ever. Deep into extra time and with only Jerzy Dudek to beat, Andriy Shevchenko - European Footballer of the Year and one of the most feared strikers at the time - must've thought he's won it for Milan. But we now know Liverpool's No. 1 had other ideas. And what about the second best save ever? Well, to me at least, that honour also goes to Jerzy Dudek. No one expected him to save it. Not this time. I mean this was a penalty! Surely Shevchenko won't miss this one. Fingers crossed, legs crossed, I was cautiously optimistic at best. But Dudek did pull it off and showed the world in that one fleeting instant the meaning of the word "heroics". And thus, Liverpool FC were once again Kings of Europe. Looking back, if that game were to be played again tonight with an identical sequence of events, this would likely be my final entry on this blog. My heart was seven years younger then. No doubt today the ol' ticker won't be able to take the thrills and excitement, the ups and downs, the dejection and ultimately the elation associated with the miracle that is Istanbul 2005. Nine and a half times out of ten, I'd be sat in front of the telly - Pringles in hand - whenever the mighty Reds played. That half occasion when I did not would be when my alarm failed to go off (you know, those 2000hrs GMT matches). The game was to kick off at 3am my time on 26th May 2005. That night, I decided not to rely on my then 9 year-old well-rusted made-in-China alarm clock. THIS was too important to miss. I was gonna wait. And my word, was it worth staying up for! After a first half to forget and shouldering a 3-0 deficit, we all know how the Redmen took the game to Milan with gritty, in-your-face football in the second; so I won't go into that. Not even those three magnificent goals in those 15 minutes that shook the world (to be honest, they had me jumping up and down in elation like a 6 year-old). What I do wanna talk about are three equally special, game-changing moments in the game as far as I'm concerned. 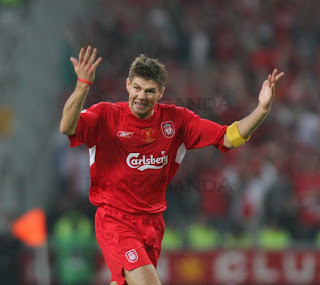 The first is Steven Gerrard's "C'mon guys!" gesture after throwing Liverpool a lifeline with that looping header in the 54th minute which left Dida watching helplessly as the Reds pulled one back. No elaborate, cocky, kiss-the-camera celebration. Nothing of the sort. A quick high-five (or was it a low-five?) with John Arne Riise who provided the assist and Captain Fantastic was already scurrying back towards the halfway line; spurring his teammates on along the way. A seemingly small gesture but I'm sure it carried a huge impact on what was to come. You could tell Stevie wasn't about to throw in the towel. More importantly, he believed. It was in his body language; and that brought the best out of his brothers-in-arms. The mark of a true leader and leading by example. Love that moment to bits. Yet another special moment in the match was, needless to say, that extra time super-save by Dudek. Had Shevchenko's point-blank effort gone in, Milan's players would surely have defended with eleven men to the death, drunk the rest of the champagne (they'd already opened it at half-time, no doubt) and left the Ataturk Stadium triumphant. But Dudek wasn't having any of it. He wanted a sip of the sparkling wine too, and that was motivation enough for him to produce the finest save in football history. The big Pole's feat left arguably Europe's most feared strike partnership totally dead-eyed. Milan's Ukranian goal poacher was obviously gutted and in disbelief. So was World Footballer of the Year to be, Kaka. Love it. The third moment of significance is kinda strange 'coz we didn't see it on the telly. You see, it took place inside Jerzy Dudek's head (before or during the game, I wouldn't know). I'm talking about that moment when he decided to mimic the madcap antics of another great Liverpool 'keeper from an era bygone; you know, that Zimbabwean nutcase Reds around the world loved so much. As you know, spaghetti legs was successfully employed by goalkeeping maverick Bruce Grobelaar during the 1984 European Cup final against Roma. I believe to this day it was this same pasta act by Dudek that actually gave Milan's penalty-takers the heebies-jeebies (as it did Francesco Graziani in '84) and tipped them over the edge when it mattered most. For sure, the sight of Dudek squirming around on the line proved too much for Andrea Pirlo and Serginho. As for Shevchenko's oh-so crucial penalty, well, he looked barely bothered didn't he with that timid effort? And so it was that Liverpool FC's UEFA Champions League campaign of 2004/2005 would deservedly end in triumph. It had been a long wait - too long by their own standards - but as the saying goes, all good things are worth waiting for. 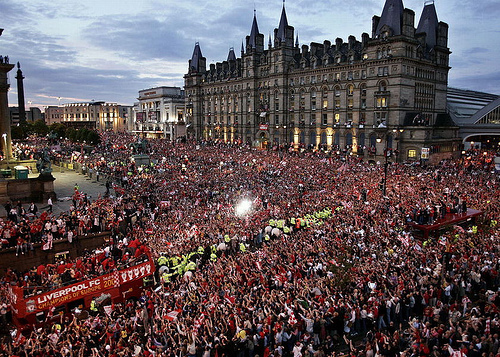 What the world witnessed from the mighty Reds on the night of 25th May 2005 were true grit, herosim, courage, trust, leadership, brotherhood, stubbornness and above all, belief all rolled into one. I was in tears. But so was Andriy Shevchenko; but for very different reasons. Hell, even Rafa Benitez managed a rare display of emotion! And that says a lot. It mattered not that it was already 6am here by the time Stevie lifted the European Cup, or that I was utterly cream-crackered from work and lack of sleep. I had already decided by then that I'd close shop for the day. Those coffee addicts will survive another 24 hours without their caffeine fix. For this was a day for celebration. A day to enjoy and savour Liverpool FC's victory. It was a day when I had witnessed arguably the best game of footy in history. Above all, it was the day Old Big Ears finally came home. This time to stay. I have since been informed by a Facebook friend from Liverpool that it was Jamie Carragher who suggested the use of spaghetti legs to Jerzy Dudek for the penalty shootout. Thank you, Sue. i was just gonna say carra told him to do it, then i read your last comment lol. good stuff vincent ynwa!!! 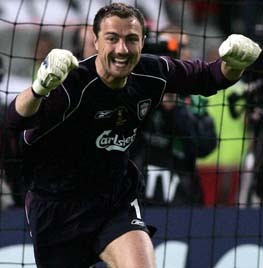 Best moment of the whole game (when watching it now) was Dudek's reaction to the extra time save from Shevchenko. Camera zoomed in on him after a split second and his face was all tension. Then you could see the smile forming and then you saw the smile. And then cool as you like he started jive nodding his head as if to say "yeah, I did that..."